1: To Make the Brownies: Preheat oven to 350 degrees. Spray a 8×8 non-stick baking pan with cooking spray. Place everything in a blender or food processor. Blend/process until beans are smooth. Using a spatula, scoop the batter into prepared pan, and spread evenly with spatula. Bake for 20-25 minutes. Remove from oven and let cool before cutting. 2: To Make the Cream Cheese Frosting: In a medium bowl, beat together the cream cheese with the sweetener and vanilla, mixing with an electric mixer until smooth and creamy. Place frosting in a ziplock bag, and trim off the corner for easy piping. To Make the Santa Hats: Use a small round cookie cutter (or a small mouth jar/glass may work), and cut out 16 round brownies. 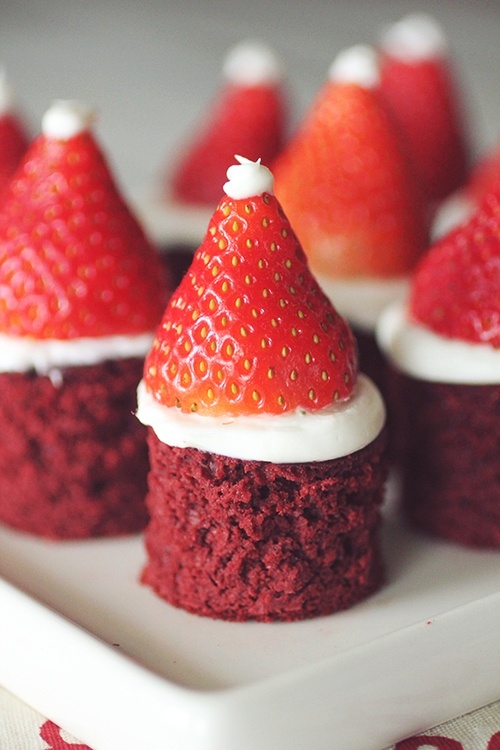 Top each brownie with a small amount of cream cheese mixture, and a strawberry as the 'hat'. Chill until ready to serve. Enjoy!